The 2019 Ms. Wheelchair Kansas was recently crowned during a weekend ceremony held March 3, 2019, at the DoubleTree Hotel in Lawrence. Andrea Romero received her crown after participating in four judging sessions, as well as many other activities, throughout the three-day event held March 1-3. The weekend concluded with a formal crowning, where Andrea was chosen as the new titleholder and fellow contestant Kynedi Weaver, of Olathe, was chosen as the runner-up. The crowning ceremony was attended by more than 70 family, friends, and community members. The event consisted of platform speeches by the two contestants, as well as two on-stage questions. The audience enjoyed a slide show of memories from the weekend; some entertainment from magician Curtis Sneden; crowning of nearby state independent delegate, Ms. Wheelchair Nebraska, Aubrey Freeze; and a farewell from the 2018 MWKS titleholder, Allison Merriam of Kansas City, and Little Miss titleholder, Ariana Hutchinson of Topeka. Little Miss Wheelchair Kansas 2019 Announced at Crowning! 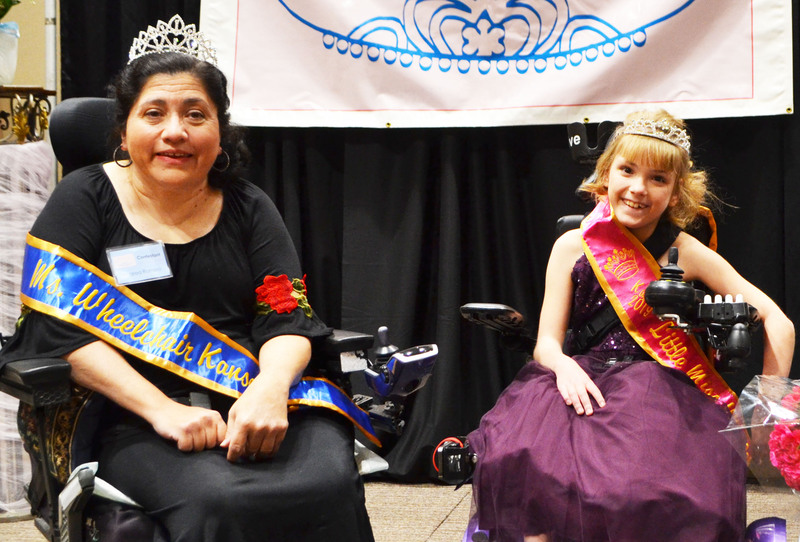 The 5th Little Miss Wheelchair Kansas was announced at this year's crowning ceremony. OE Barth, of Topeka, was selected as the new Little Miss! OE is a young lady full of life who lights up a room with her smile! OE is 11 years old and is a 4th grader at North Fairview Elementary in Topeka. favorite option: 1. Shop Online at iGive.com! Have plans to shop online in the coming months? When you shop a variety of popular stores at iGive.com, a financial portion of your purchases comes to our program. And, if you shop within 45 days of registering, Ms. Wheelchair Kansas gets an extra $5. 2. Raise money by searching the web. Use iSearchiGive as your search engine and MWKS gets $0.02 per search. 3. Make a direct financial or in kind donation... always an option.